Continuous delivery platform startup Wercker has expanded its automation pipeline offerings with Wercker Workflows. Working with Amazon Web Services, CoreOS, Deis, Kubernetes and Mesosphere, Workflows allows developers to customize and automate the steps in their build, push and release phases. “The thing we’ve noticed using containers ourselves and building on top of Kubernetes, but also from our users who are using schedulers such as Mesos, the old two-step [build and deploy] paradigm no longer applies,” said Micha Hernández van Leuffen, founder, and CEO at Wercker. Container-based development often involves multiple phases, Hernández van Leuffen explained. A development team cranking out container-based applications needs to push them to the registry, or to Kubernetes or another type of scheduler. The production may involve multiple copies of a container running on top of Kubernetes. Using a simple YAML configuration, Wercker enables developers to set up automated pipelines for building Docker containers with an aggregate of pass/fail steps in a set environment. The service then allows deployment to various cloud platforms, ranging from Heroku to AWS and Rackspace. In a video, van Leuffen demonstrates how you can create automated workflows between your pipelines. With Wercker Workflows, users define a hook to trigger a pipeline to be executed in a Docker container. The hook can be defined as a Git source or, for the first time, another pipeline, according to the company. One Git source can trigger one or multiple pipelines that can be chained together sequentially or in parallel. Pipelines can incorporate external services, such as Slack, Heroku, Deis, Kubernetes or others. Users can automate any mix of build or push commands to allow for consistent releases to container registries, staging and production environments. They also can isolate pain points, such as a pipeline step that takes longer than average, and save on development time by only re-running the problem pipeline as needed. Project hosting service Bitbucket included the add-on Wercker YAML Viewer in December to allow users to visualize their workflow pipeline and check build status. Amsterdam-based Wercker was part of the 2012 startup incubator program Rockstart Accelerator. It raised $4.5 million in January from Inkef Capital and Notion Capital, bringing its total funding to $7.9 million. It also announced its command line interface (CLI) developer tool that facilitates the containerization and deployment of applications and microservices on the desktop. Wercker competes with the likes of Shippable, Drone and CloudBees in the continuous delivery space. The company announced the new technology at the CoreOS Fest in Berlin, being held this week. 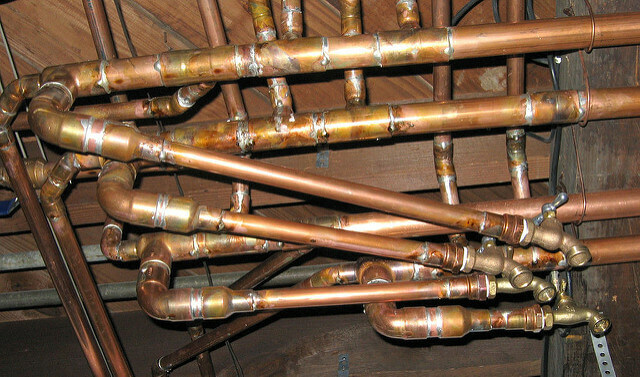 Feature Image: “Pipes” by Michael Pereckas, licensed under CC BY-SA 2.0.